If you're on the more prairie/western side of Dolly, I think these are going to be great pieces for. And even if you're most into the eastern european side of the style (like myself), you still can make them work. 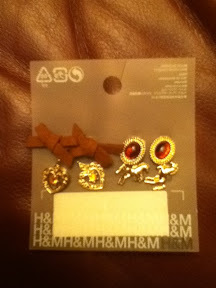 So firstly, the set of four pairs of earrings for 4.95$: you get some little faux-suede bows, little horses, small ovals with amber-look stones, and some tiny filigree hearts with amber-coloured gems. Adorable, and they all have that great vintage air to them. 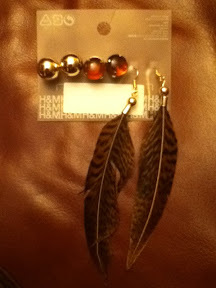 Next, a set of three pairs of earrings for 6.95$: kind of large gold spheres, round amber-look cabochons, and some great dangley feathers. 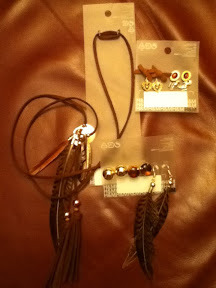 Honestly, I just wanted the feather pair, but I can probably make use of the cabochons. 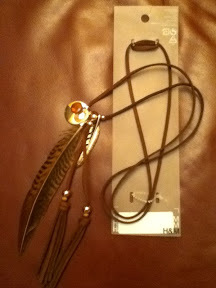 Lastly, fabulous faux-suede necklace for 9.95$: it has a large feather, tassels, amber piece, a sort of medallion thing and a smaller feather as well as a gold-tone metal feather. You can definitely wear it as is, but I'm going to be doing some alterations to mine.